Today when I got off work I installed the newly painted end links. It has been so hot and humid so far this week that I have not been able to paint the front end link hardware I prepped on Sunday. Today the conditions fell into place at just barely under 50% humidity in the garage. I was able to get the hardware painted with two coats of POR-15. Because POR-15 is the opposite of paint (as far as most of its characteristics), it dries very quickly in high humidity. I did not need to wait long at all between coats. Billy from Knight Designs called me this morning and said he was shipping out the third season front nose and rear stone guards today. I cannot wait! I will do a video overview when they arrive. We had a heat advisory all weekend, but I decided to attempt to work in the garage yesterday anyway. It was not quite as hot as Saturday, but still one of the hottest days we have had all year. It was 84 degrees and very humid in the garage (about 12 degrees cooler than outside). I decided to leave the overhead door closed to keep the heat out. 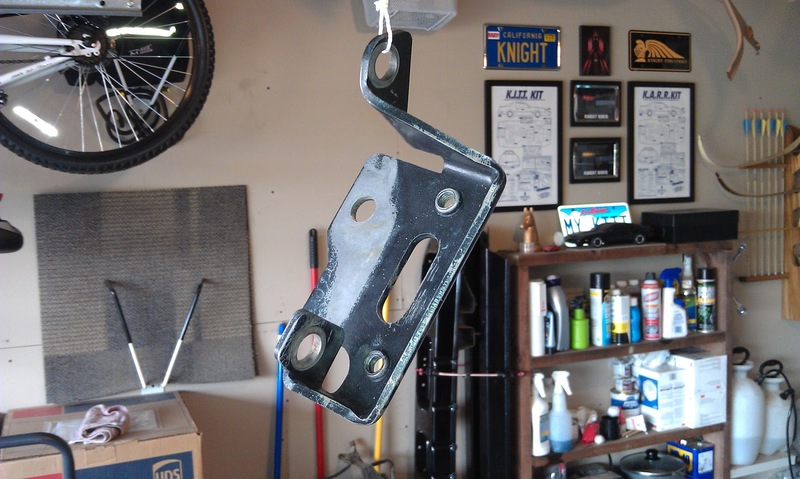 I started by re-installing the K-member support bracket. When I got off of work yesterday afternoon I started by applying the third coat of POR-15 to the bottom of the frame where the steering gear box mounts. 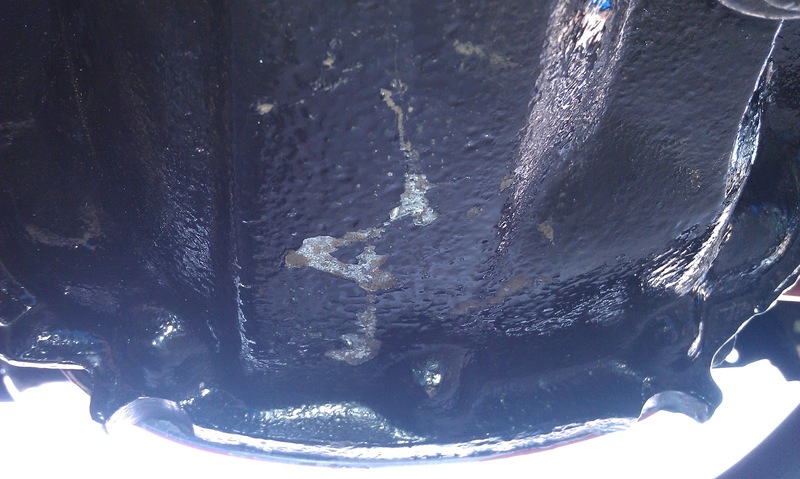 The repair welds look much better with two coats of POR-15. I decided not to use the UV resistant BlackCote that we used in the rest of the engine bay because I did not want to reopen the can for one coat in such a small area. You can really see the difference in the finish between the two. The self leveling feature of POR-15 is just nothing short of awesome. 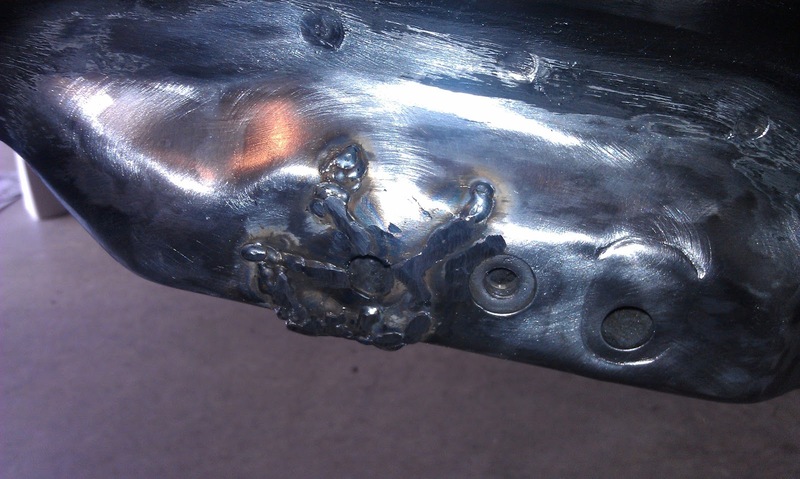 Today after work I started grinding down the welds we made on the frame yesterday. I really was not sure how far I needed to grind them down, so I tried to flatten them out so that the mounting surface would be flat. I may need to get a second opinion on these. 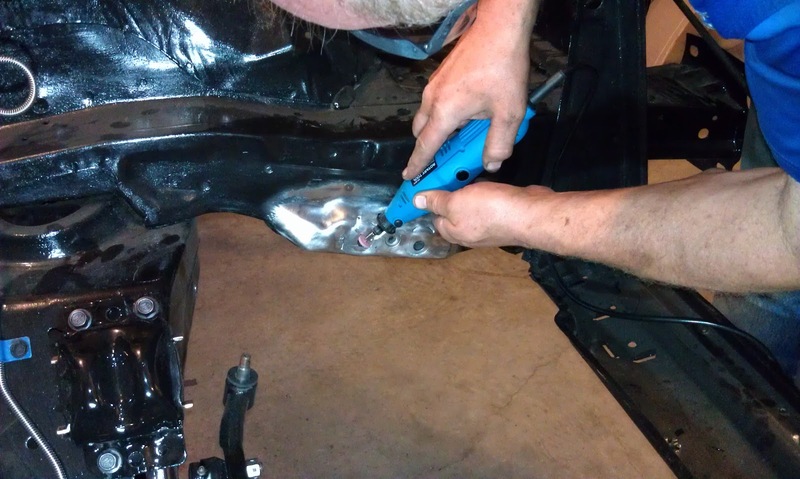 Troy came over tonight to weld the stress cracks in the frame where the steering gear box mounts. He was surprised we had missed these cracks before, too. There were a few more than he was expecting, but nothing as bad as what I have seen online. We started by drilling a stop hole at the end of each crack to create a stress relief point and prevent if from spreading any further. Then we used the rotary tool to grind grooves/channels over each crack. This will allow the weld to spread out and cover the area. The stainless steel "L" trim which was only featured on the 1982 models is a must for an accurate KITT conversion. 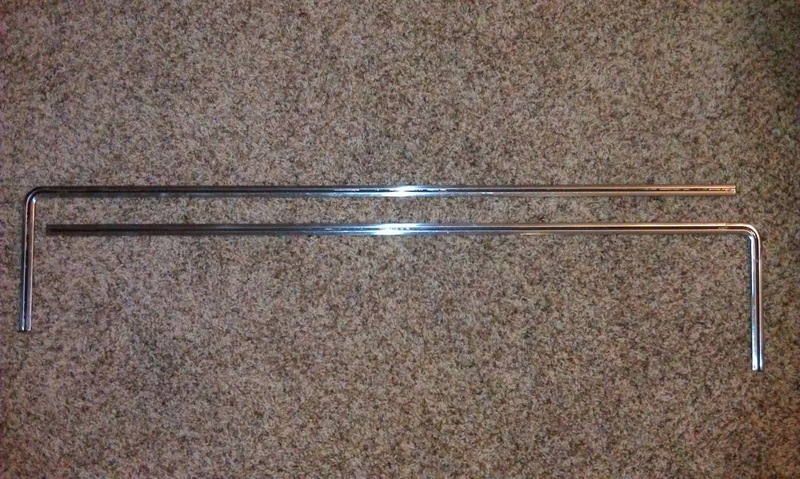 The stainless part of the trim is in great shape and needs just a little polishing to make is shine. The black inner area will need to be touched up as the paint is worn off in spots. I plan to use thin black pinstriping to redo this area. Stress Cracks Or Just Stressing About Cracks? 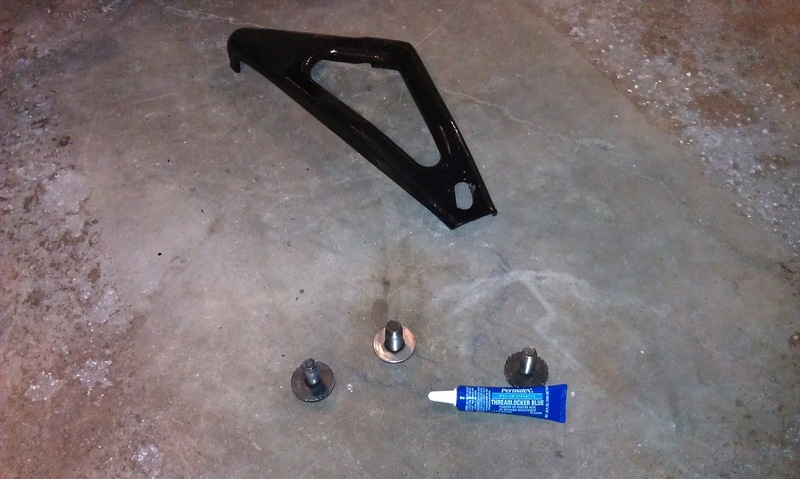 Today I really did not plan on doing anything other than getting the parking brake assemblies for the rear calipers, the steering gear box bracket, and the fuel and brake line bracket painted with three coats of POR-15. It is a funny thing how seemingly simple things rarely go as planned. 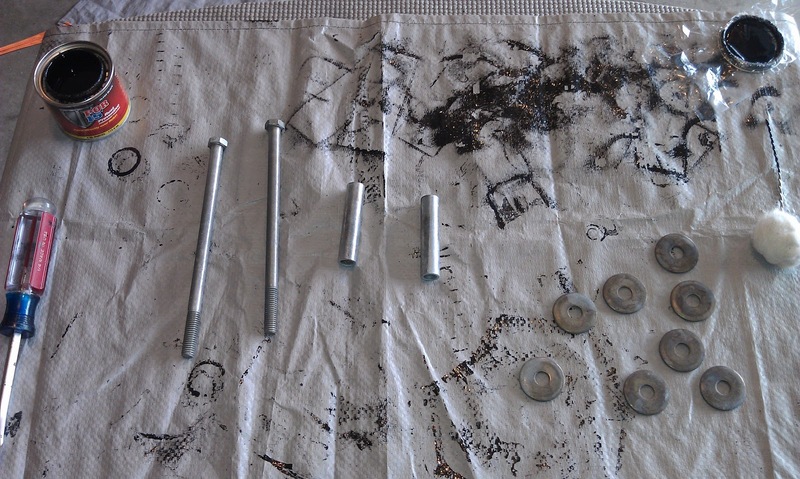 Here are the parts before the first coat was applied. 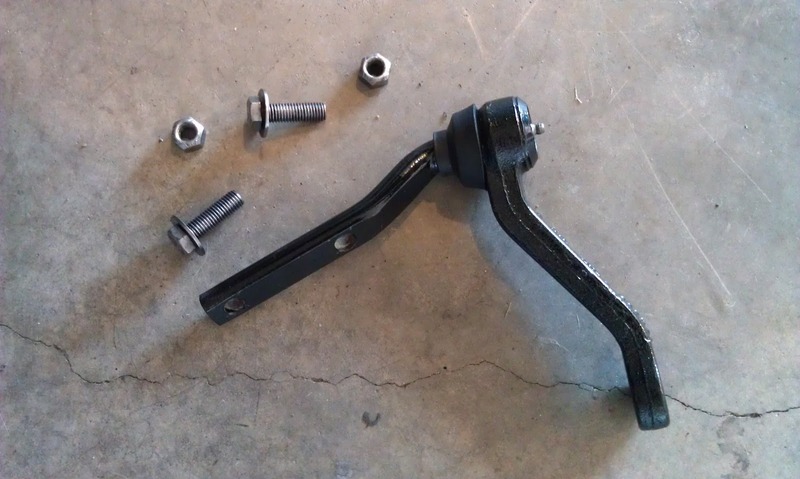 My goal for today was to clean up the garage and go through the rest of the hardware looking for other brackets that may need to be painted with POR-15. 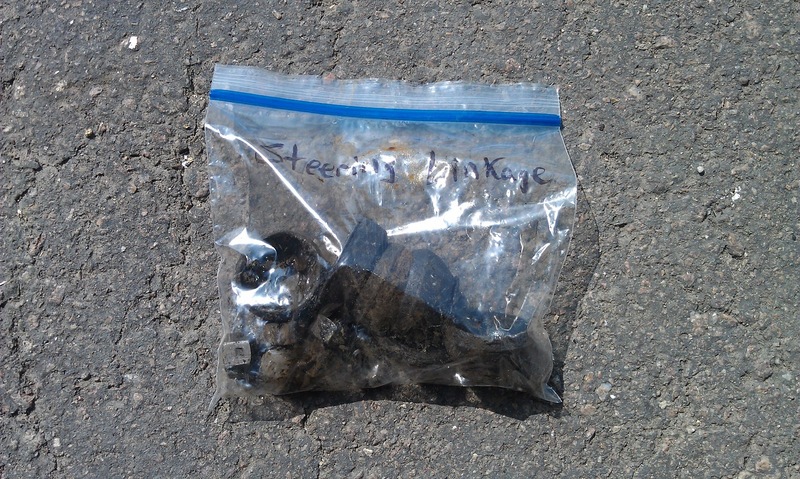 I did not end up finding anything that I thought needed to be painted aside from the parking brake assemblies for the rear calipers, the steering gear box bracket from yesterday, and a fuel and brake line bracket that I missed in the last round of painting. I am sure there will be more, but for now I think these should take care of any more unexpected surprises. I spent quite a bit of time putting tools away and doing some general clean up in the garage. I am looking forward to being able to put the Freestyle back in the garage, but the replacement hatch glass is still preventing that and I am not yet ready to move that back under KITT. 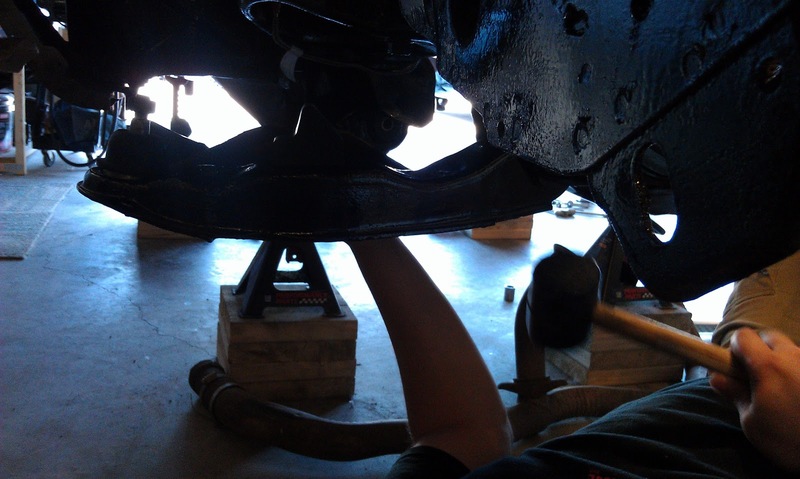 I started by bolting the idler arm back into place. Cary brought over his voice box project this afternoon. He has been building a working voice box from the Knight Technologies wiring plans. 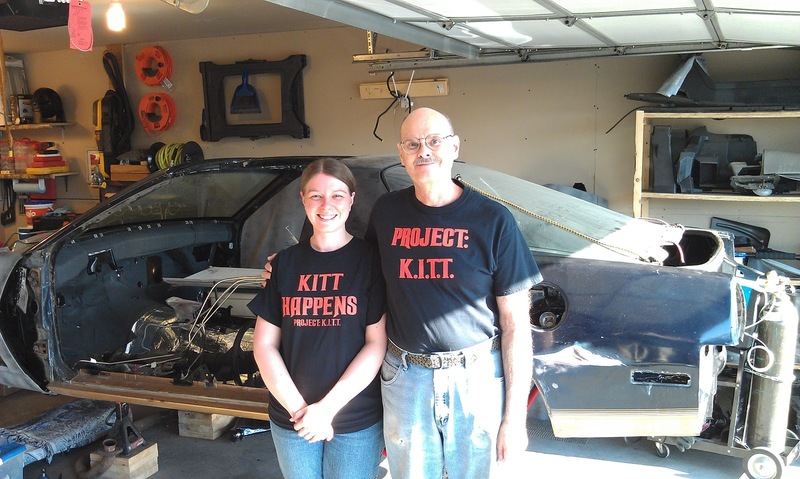 It is only partially complete at present, however it was complete enough to allow KITT to make his very first introduction. All I can say is I am glad his scanner (vision) is not operational because I can only imagine the witty retort he would have for my explanation of the current state of his body and the mess in the garage. Here is a video of his very first words. I spent a lot of time this week prepping the hardware I need for the front end install and trying to find replacement parts for items I had not planned on. 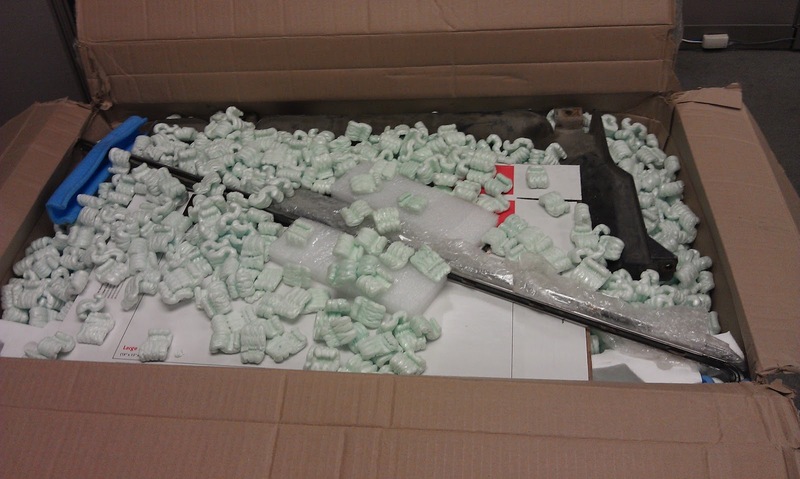 Here is the bag of front end hardware. 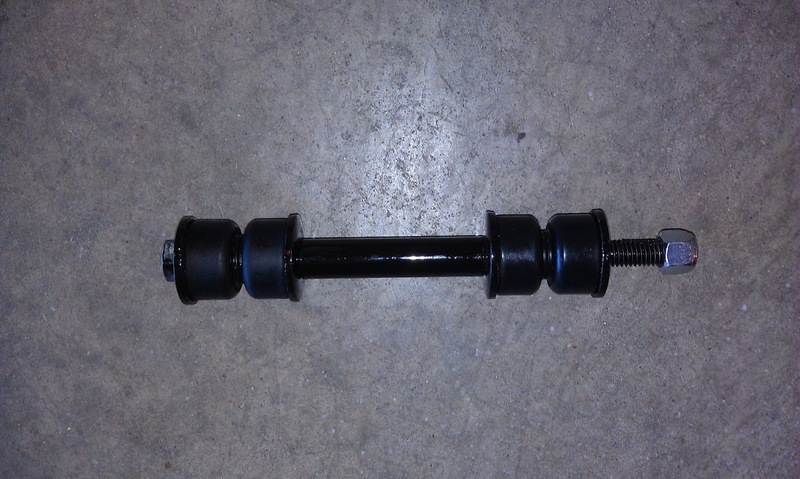 It contains the castle nuts, the old tie rod boots, the washer-style seal for the center link, and the dust boot for the idler arm. Today after work I wanted to paint the damaged areas on the rear end. This is by far one of the worst spots. 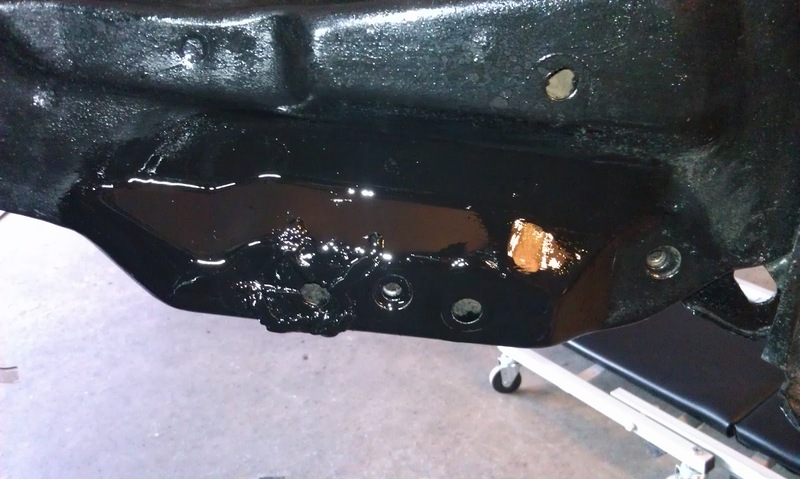 This is where the rear end slipped off of the jack when we were attempting to mount it in place. This actually gouged the metal. Sunday afternoon Sara and I installed the passenger side A-arm. This was a little easier than the driver side only because we had discovered a few tricks during the first installation. Dad stuck around to help us some more after Troy left on Saturday evening. Thanks Dad! Here's a picture of my main support team. Troy came over yesterday afternoon and brought over the rear end and the fuel sending unit with a new fuel pump and fuel strainer. 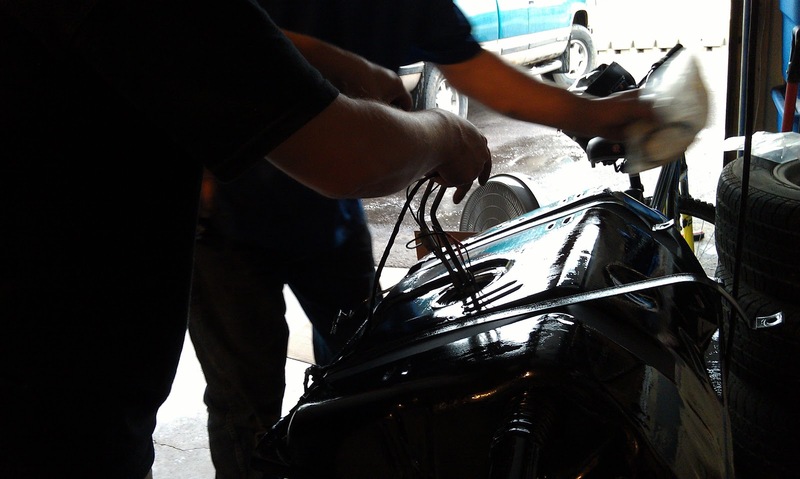 We started by installing the fuel sending unit. 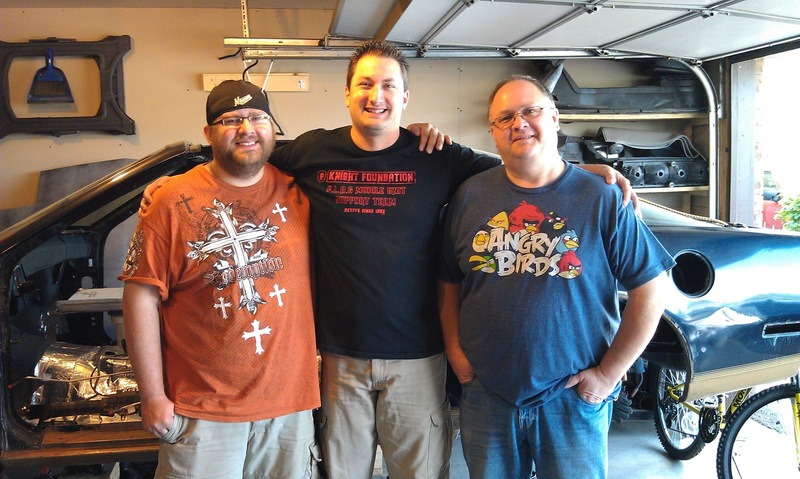 Saturday morning my dad and brother Josh stopped by to see KITT! 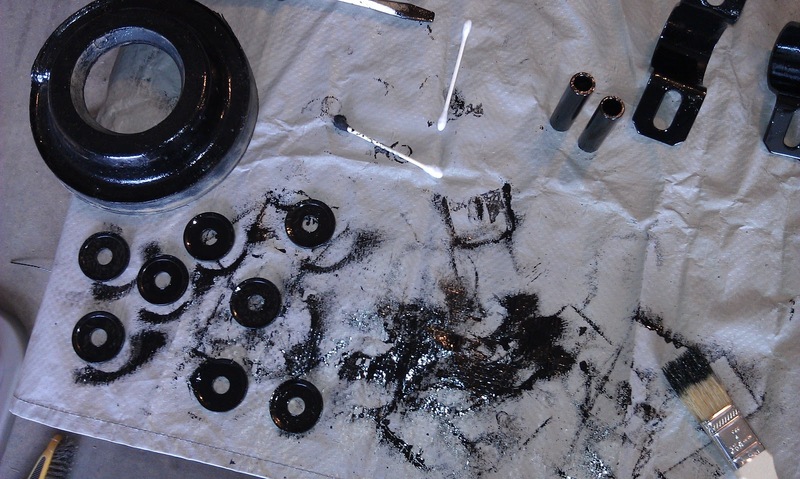 Friday after work I applied a second coat of POR-15 on the flip side of the washers for the rear sway bar end links. Then I used a q-tip dipped in POR-15 to coat the inside of the sleeves for the end links. I thought it would be a good idea to at least have a single coat on the insides. 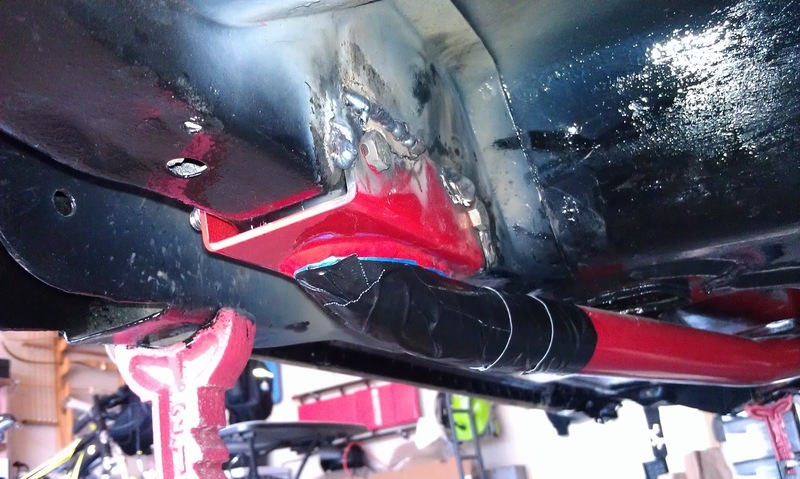 Yesterday I started by prepping the rear subframe connector mounts for paint. I masked off the area I did not want to paint with painters tape and then covered that with a layer of duct tape for durability.